Sundays, 9 a.m. & 5 p.m.
Join us for worship! Join our family for worship, prayer, and fellowship Sundays at 9 a.m. and 5 p.m.
Trinity members: plan to attend the Annual Meeting, February 3, 2019, following 9 a.m. worship. Trinity Game Night! Come Friday, January 18, at 6:00 p.m., bring a snack and a favorite game. Trinity members: plan to attend Adult Forum sessions on January 6 & 13. The sessions will provide highlights about how we are fulfilling our mission and provide information about the scope and rationale for a Special Projects Campaign. Yoga continues on Tuesdays at 7 p.m. Beginners and experienced are welcome. $5 per class. Tender Loving Care Preschool is accepting registrations for 2019-2020, beginning January 14, 2019. Trinity members may register during the week prior. Visit tenderlovingcarepreschool.webs.com for more information. As part of the ELCA Young Adults in Global Mission program, our own Brittany Barkus is participating in a mission in Australia. Support her mission here. Trinity member Deaconess Erin Brown will start her LDA Internship in Costa Rica in August, where she will support the youth and music programs at the Sola Fe church. Erin needs to raise $6,500 in living expenses for her year-long internship. Contribute at the church or donate online; Add “Erin Brown” in the memo line. Read Bishop Bill Gafkjen’s letter on the Church’s duty to challenge racism in all forms explicit, implicit, or systemic. The ELCA stands firmly against all forms of hatred and discrimination. The Church celebrates the blessings of cultural, ethnic, and racial differences. Read the ELCA statement confronting racism and anti-Semitism. Several opportunities to serve exist at Trinity and in the community. Read more in Parish Notices. Stewardship at Trinity helps make our many ministries possible and keeps the lights on. Read about ways to support your Trinity family here. Find up-to-date information about church life on our Facebook page and in the Parish Notices. 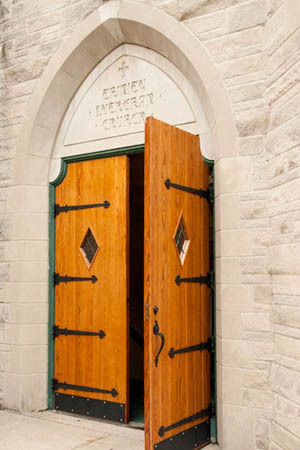 Trinity Lutheran Church, Valparaiso is proud to be a Reconciled In Christ congregation, welcoming people of all gender identities and sexual orientations as part of this community of the people of God.